Over the past week, I’ve been busy “Future-Proofing.” Below are links and lists from bylines I’ve written sharing my expectations for the coming year. We’ll see how things shake out but the one thing I’m certain of is that 2011′s gonna be Googley! Search and Social 2011: Kaboom! 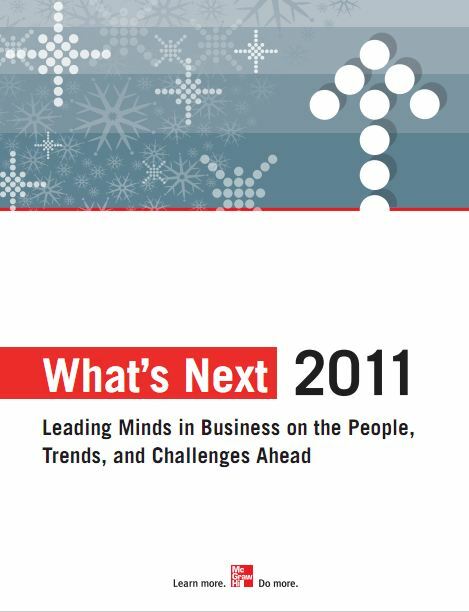 Yesterday, McGraw-Hill released an eBook compilation of short essays from its authors on “What’s Next” for 2011. The topics range from innovation to investment to sales to leadership to, of course, search. It’s a great, quick read from some of the “leading minds in business” so be sure to download your copy. Search marketing and social media are on a collision course. And 2011 will be the big bang. The implications for marketers, search engines, and social networks alike will be profound. Here’s what you need to know. To date, search has been the primary way people have found things on the Internet. Looking for a place to eat? Google it! Want to know what camera to buy? Google it! As it turns out, your friends, families and others in your social circle (read: people) are better indicators of what you might like than webpages stuffed with keywords and links (read: webmasters). Who’d have thunk it?!? That Zuckerberg guy, that’s who. Indeed, Facebook stands positioned to lead the next wave of innovation in search marketing. And this will likely benefit Microsoft, of all companies. In early October, Facebook and Microsoft announced that “likes” (all those little “thumbs up” buttons that get pushed on Facebook and other sites across the web) will be integrated into the Bing search algorithm. Now, instead of search engines deciding what websites are most relevant to you based on the number of links they have, rankings will be based on the number of likes they have. And, more importantly, likes by people in your social graph. So, how can you make sure your organization is prepared for this shift in search power? For starters, make sure you’re “well-liked.” Put that button on your website and encourage people to click it. As an example, Walmart recently started running promotions that offer exclusive discounts to people who like its page. And don’t forget Twitter. Set up an account and start tweeting. If the “like” trend is any indication, it won’t be long before Twitter followers and “retweets” are applied to search engine algorithms as well. But don’t fire your search engine optimization team just yet. Google still controls over 70% of the global search market so it’s critical to make sure your website is well-optimized for keywords and links. That said, it won’t be long before Google gets social. Whether it’s an acquisition of Twitter or a new social network called Google Me, you can be sure the Big G will be bringing the big guns. So, as 2011 draws near, the best advice I can give comes from Chapter 8 of my book. Test everything. Get more likes. Get more links. Get Googley. Get Facebooky. Get Bingy. Get Twittery. When it comes to search marketing, success in 2011 will not be the same as 2010. The future is social, whether you like it or not. 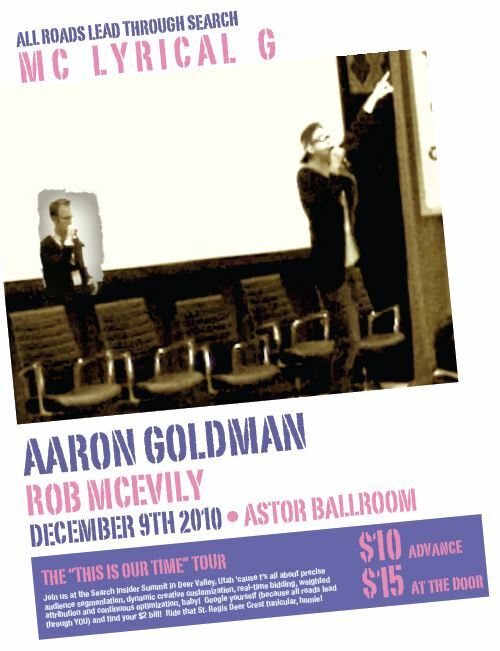 Aaron Goldman is Chief Marketing Officer at Kenshoo, a global leader in search marketing and online advertising technology for advertisers, agencies, and local marketing providers. 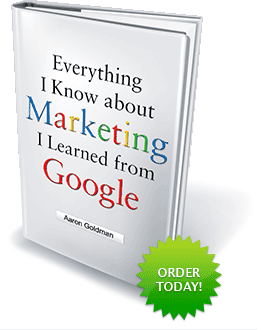 He is also the author of Everything I Know about Marketing I Learned from Google. I was being dramatic to make the point that, if it wanted to, Google could quickly and effectively build something of similar scale to Groupon. 1. Brand recognition. Groupon is the Google of the deals space. When Groupon calls, merchants answer. And when Groupon emails, consumers open. 2. Relationships with merchants. Small/medium-sized (SMB) businesses in cities around the world look to Groupon as a shot in the arm for sales. Not unlike how they looked at Google a few years ago. The problem, of course, for SMBs is that Google taps out once all the relevant queries are tapped and bids get too high. 3. Relationships with consumers. Every day, Groupon sends me an email. And every day I look at it. I can’t think of many other brands I have that frequent interaction with. 4. Data. Groupon is sitting on a treasure trove of data. What offers people like. What offers YOU like. What price points make a deal tip. There are tons of companies that could monetize the heck out of this. 5. Revenue. Rumors are Groupon is doing anywhere from $800 million to $2 billion in annual revenue. That’s pretty easy to value. Clearly, Groupon has built a fantastic company with tremendous value. But, as any entrepreneur knows, one of the keys to success is defensibility of the business model. And, as I pointed out yesterday, I’m not sure how defensible Groupon is… at least not when it has companies like Google keen on getting into its space. That’s why if I were Andrew Mason, I’d be getting mine while the getting’s good. I think Groupon was NUTS to turn down $5-6 billion from Google. I mean, c’mon now, we’re talking about a COUPON WEBSITE here! As for what Google wanted with Groupon? I have to believe Google could build these things itself. 1. Hire a bunch of freelance salespeople (or buy a Yellow Pages company) and get in front of SMBs with offers to run Groupon-esque deals. 2. Launch Google Deals and send an email to every Gmail user with the opportunity to opt-in. If it only took Groupon a couple years to scale sales and stimulate demand, I bet Google could do it in one. Eric, Sergey and Larry – if you’re reading this, that’ll be $5.4 billion, please. The theme of Day 3 at the Search Insider Summit is consumers, privacy, and data. So, naturally, I had to kick things off with a little Vanilla Ice, “Search Search Data.” This time, DJ Rob threw down the beats on Garage Band. Lyrics below and be sure to check out Day 1 – Park City Love and Day 2 – Fresh Prince of Deer Valley. Don’t take data without permission. Data is keeping me up daily and nightly. What all do you track? Scrub it all fresh like a Yankee candle. You know if I’m single or if I’m a groom. Deadly, when you start tracking my family. Now you got my address? Man, that’s a felony. Love it or leave it, data’s coming your way. Leverage it all and then make your pay. If there was a cookie, yo, you’ll count it. Check out my clicks while your datamart pounds it. On the ski slopes is where I spend most of my days. Chillin’ out, rappin’, actin’ like a fool. Tryin’ to make this SEM game look cool. When a coupla butlers who were trying to do good. Started doin’ things I never thought they would. I got one fruit plate with apples, strawberries and pears. Whistler’s pretty nice this time of year. But Deer Valley is fresh, we got funiculars up in here. But I thought, nah, forget it… when I ski, I get air! One more verse, it’s the last one here. These rhymes I don’t rehearse, that must be clear. Let me see, forgot what I was gonna say. Gotta gotta gotta get down on my knees and pray. And I yelled to Ken Fadner, yo holmes, sorry I’m late! It’s time to get my rap off cuz it’s day 2! Update: Check out Day 2 with the Fresh Prince of Deer Valley! This show is unstoppable, you know it’s the best. Be sure to pack your vest before you head out the door. We’ve got all search geeks in this room, where the search geeks be? The search geeks that never leave the spreadsheets empty. And these geeks, they run the marketing machines. Spend a lot of coin on Google, Yahoo, and Bing. Ever since Sergey and Larry were countin’ links fool. It’s like we unlocked the Fort Knox of data. If you ain’t meetin’ others, you ain’t makin’ the most. So throw your hands up if you feel the same way. Welcome to SIS. The show starts today! SIS, no doubt about it. SIS, knows how to party. In the city…. city of Park. In the city…city of Park. Keep on searchin’, keep on searchin’, yeah! Last week brought word that Google is being investigated by the European Commission for abusing its dominant market position and preventing competition (aka acting like a monoploy) with the way it ranks websites in organic listings. Naturally, Google responded by playeing its trump card of “we only do what’s best for users.” Ahh, gotta love the altruism! “Manipulating rankings” is Google’s business model. The question is whether it is manipulating maliciously and stifling competition in the process. It will be tough to make this case. Google has a long track record of manipulating rankings solely for the purpose of giving searchers more relevant results. 2 nights ago, I had the pleasure of dropping some knowledge (and rhymes) with an eclectic gathering of friends, family, and colleagues at the always eclectic Catalyst Ranch. Over the course of 90 minutes, I powerpointed, whiteboarded, and rapped my way to a donation of about $200 and 50 used children’s books for Open Books, a local Chicago non-profit that promotes literacy. Besides the unique format and venue, this event was unique because my mom and dad (and wife!) were in attendance. This was the first time they had seen me present anything book (or work) related in public. Needless to say, when it came to my trademark $2 bill at the end, I had to do a little bit of self-censorship so what you’re about to see is rated very PG…. Thanks to Larry Bak from Elevate Studios for the steady hand recording these on his iPhone. Now that’s what I call FaceTime!